The Raxxess SWRD-24P SWR Perforated Front Rack Door is the perfect addition to an existing SWR rack that increases the level of security and protection for your valuable equipment. Perforated vents promote optimal airflow in your rack and keep equipment cool. 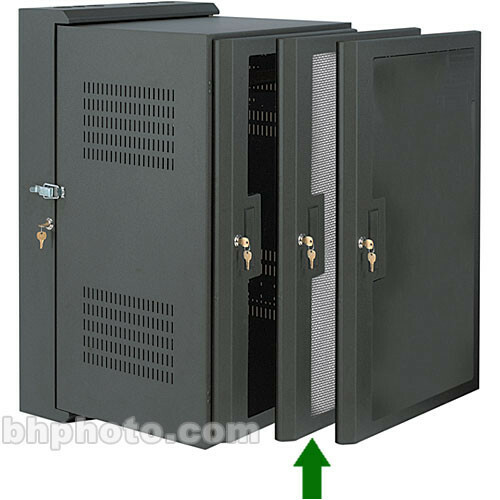 This door is designed for use with SWR 24U racks and includes a standard key lock. Raxxess makes quality support equipment for audio, office, or computer needs. Data and telecommunications needs are well-served as Raxxess produces high-quality floor and rack mounted solutions for cable management. Whether it is a guitar holder, cable depot, music stand, utility shelf, or a place to hang your headphones, you can count on Raxxess to have the answer for you. Protect your equipment from dust and other foreign debris by adding a door to your rack. Perforated vents increase air flow in your rack and extend the life of your equipment. Add another layer of security to your setup with this door's standard key lock.